These are my picks of gifts for someone with depression or anxiety. I think anyone interested in personal development or working on managing their mental health would appreciate these gifts. Let me know what you think and if you purchase any! I always love to hear from you guys. If you’re going to be doing any online shopping I definitely recommend you signup for EBates. EBates gives you cash back when you shop online and right now they will give you $10.00 just for signing up. I had heard about EBates before but never signed up because I thought it was a scam. Then my friend told me how she got all this cash back from it and I decided I had to try it. It is legit you guys! I am terrible at shopping sales or using coupons but this site is seriously so easy even I can use it. 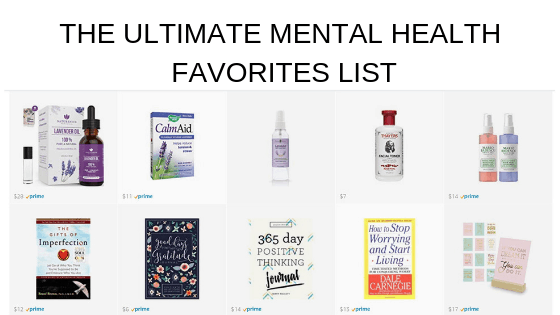 If you’re not in the mood to shop but you’re looking for information be sure to check out my other posts about depression. OK, now onto the gift guide! There are lots of great resources you can pass onto someone struggling with mental illness. One of my favorites is the crisis text line. It can be difficult for people to reach out to a hotline during a crisis but the crisis text line lets you text with a trained specialist instead of having to talk on the phone. You can have them text CONNECT to 741741 if they need to reach out. Ultimately, the person with mental illness is responsible for their own healing. You can let them know that you are there to support them and keep reaching out. Often people struggling with mental illness have a difficult time asking for help when they really need it. Headspace is an awesome app with lots of great meditation training. You can get a gift membership for someone on their website here. Meditation has been shown to be an effective tool to manage stress and this would make a great gift for someone that is struggling to cope with the stress in their life. I used to use it on my lunch break when I had a high-stress office job and it really helped me recharge. There are tons of benefits from meditation and it has been shown to help everything from physical pain to reducing anxiety. Meditation could help your loved one improve their mental health and help them learn to manage their depression and anxiety. This would be a good idea for someone that you know has been wanting to start a fitness journey. You definitely don’t want to give this to someone if they might think it’s an unwanted comment about their weight. I personally love working out and think this would be a really thoughtful gift. I love working out and there have been plenty of times I couldn’t afford a gym membership. You could also get them a pass for some fitness classes like Yoga or Zumba for a more affordable option. Going to a gym or a class can be really intimidating for someone struggling with depression and anxiety. If you’re loved one isn’t up to going to the gym try getting them a membership for an on-demand workout program (I use and love this one). That way they have the option of exercising from their own home. The workout program I use has everything from weight lifting and dance workouts to yoga. There is a restaurant where I live that just started offering cooking classes and I think that would make a really good gift. Try googling where they live and see if there are any classes for something they might be interested in. Groupon is a good place to check out and you can get some great deals on there. Try guitar lessons, dog training lessons or photography classes. If there is something that your loved one used to enjoy doing try and get them a class for it to encourage them to start doing it again. Anxiety and depression can make you feel disconnected from everything and it can be easy to forget what actually brings you joy in life. I am biased because I love reading but I think personal development books make great gifts. Here are some of my favorites and I think any of these would make great gifts. They’re all easy reads with lots of great insight and advice in them. If you’re looking for a gift for someone who likes to read check some of these out. Writing is a powerful tool for personal development. Here are some beautiful journals that would make a great gift for anyone. You never know what might inspire someone to pick it up and start writing. I love the idea of someone feeling the need to start journaling and then remembering they have a beautiful journal that was gifted to them sitting on the shelf. If you know someone who is really ready to change their life a journal is a perfect tool for them. I’ve always kept a handwritten planner and I just can’t make the switch to digital. I find it so helpful to be able to organize all my random thoughts and everything I need to get done each day. I love the idea of giving someone something they can use all year long. Depression and anxiety can make your brain foggy and I use my planner to keep everything straight and make sure I am on track even when I’m having a bad mental health week. Workbooks are the perfect blend of personal development books and journals. These have interactive journaling prompts for you to fill out. These would be a great gift for someone just getting started on a personal development journey or that doesn’t like to write in a journal. All of the options below have really useful prompts to follow. I love spending the afternoon sitting outside and filling out a workbook. It helps me get clear about where I am in life and where I am going. 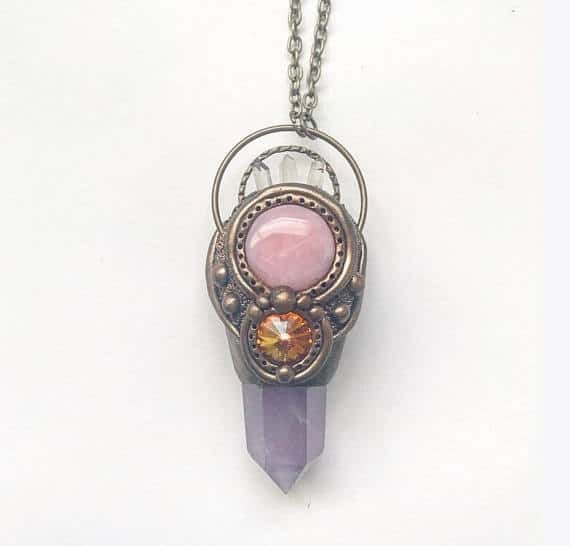 Stephanie Bellinger makes beautiful healing crystal pendants that she sells in her Etsy shop. Each stone has different healing properties that she lists in the description of each piece. I have a beautiful pendant I purchased from her that has Citrine (for confidence) and Blue Lace Agate (for communicating your truth). This would be a great gift for anyone that loves statement jewelry and unique pieces. These are beautiful handmade necklaces and they would make a thoughtful gift for someone. This is an essential oil diffuser that comes with eight different essential oils. Aromatherapy has been shown to be helpful in alleviating symptoms of depression and anxiety. I have an oil diffuser and I love it. I use it every night to make my room smell like lavender to help me fall asleep. I think this would make a really nice gift for someone. Each set comes with different oils for different purposes. You can use the citrus scents when you need to feel more energized and lavender or eucalyptus when you’re ready to relax. I love my oil diffuser so much I ended up buying one for every room of my house. If you have a coffee drinker in your life grab them a mug with an inspirational quote. I also included the lego mug just because I thought it was awesome. These would make great stocking stuffers or easy gifts for your coffee drinking coworkers. This is a great way to bring some positive energy to their day if your loved one is struggling or going through a tough time. Cute coffee mugs are an easy and inexpensive gift option that are appropriate for almost anyone. The winter time can be really difficult for people struggling with depression. A light exposure lamp helps alleviate symptoms of seasonal depression. This would be a thoughtful gift for someone who has been open with you about their struggle with depression. If you know this person struggles more with their mental health in the winter time this would be a really thoughtful and useful gift. I used to use one of these lights when I lived near Seattle and it really helped me get through the winter. Rescue Remedy is an herbal treatment for anxiety. It is easy to carry with you and can be taken as needed throughout the day. This would be a thoughtful gift or stocking stuffer for someone that has been open with you about their struggle with anxiety. I used to use it to help with test anxiety when I was in college. Now I take it with me when I travel because I get really bad anxiety on planes and in airports. If you know someone that is really struggling with anxiety this is a great remedy to try. love to take baths so I thought this bath bomb set would be a great gift for anyone that needs to relax (make sure they have a bathtub). It includes six different bath bombs in a cute package. If your loved one has a bathtub this is a nice and thoughtful gift. There are tons of inspirational prints you can find but I thought this one was really cute. This would be the perfect gift for someone who likes quotes or Disney movies. I love the idea of giving someone a nice inspirational quote as a gift to bring some positivity to their day if they are going through a tough time. This is a deck of beautiful inspirational cards that Danielle calls Truth Bombs. This would be a great gift for anyone that loves inspirational quotes or is a little spiritual. I love her writing and I recommend a look around her blog. These cards are really beautiful and I love to pull one when I wake up in the morning to help me set an intention for the day. This is a special blend of tea that is made with herbs that are known to be mood elevators. This would be a thoughtful gift for anyone that drinks tea. This is a special salt blend to put in the bath. It has aromatherapy scents that are known to promote feelings of happiness. A nice water bottle is a practical gift and would be perfect for any active person in your life. I literally carry mine around with me 24/7. This insulated water bottle will keep their beverage cold all damn day. 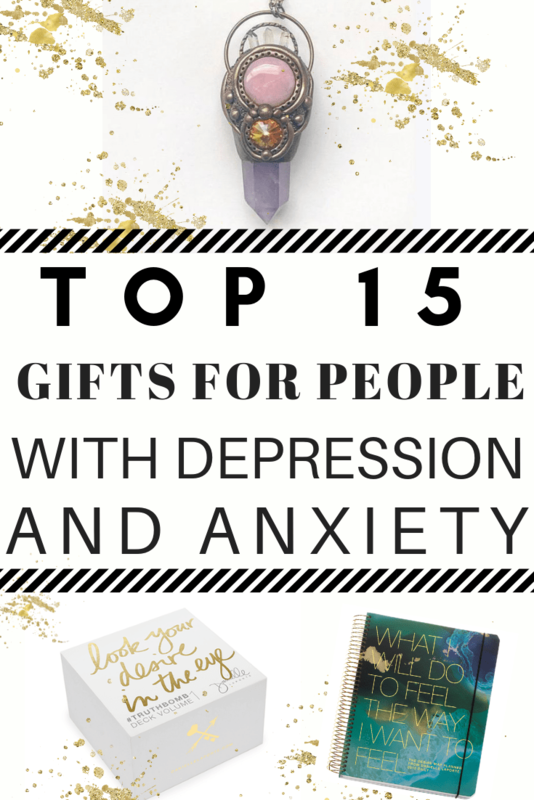 I hope this gives you some ideas for gifts for someone with depression or anxiety. 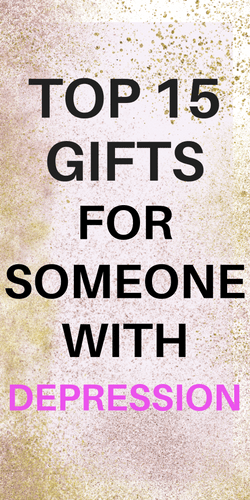 If someone in your life is struggling with their mental health I’m sure they will appreciate any thoughtful gift that you give them. I share openly about my own battle with depression and anxiety on this blog and Instagram. Be sure to let them know about my site and all of the articles I have about depression. For more information about how to support someone struggling with mental illness check out this article. Want to remember this guide? Save it on your favorite Pinterest board! Gift certificates for movie tickets would be good, too! This is a great list! Love the gift certificates for movies idea! That’s a really good list…and that Britney mug sums it up. Lol. Crystals like amethyst, citrine and picture jasper were ones that helped me through a hard time last year.